Squeaky toys are not required. You can drive around with your music up and not bother your dog. Thunderstorms and fireworks do not bother deaf dogs. 1) Deaf dogs don't know they are deaf. 2) Deaf dogs don't care that they are deaf. 3) Deaf dogs are not suffering by being deaf. 4) Deaf dogs are dogs first. 5) Deaf dogs are representatives of their breed or combination of breeds second. 6) Deaf dogs are individual dogs with their own quirks and personalities third. 7) Deaf dogs are not more likely to become aggressive than any other dog in the same circumstances. 8) Deaf dogs may startle when awoken suddenly but can easily be conditioned to awake to a calm but alert state. 9) Deaf dogs are no less healthy than most hearing dogs. 10) Deaf dogs can be easier to train than hearing dogs. 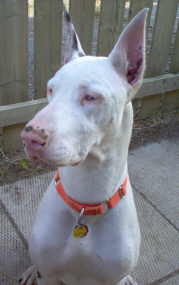 11) Deaf dogs are very attentive to visual signals, including facial expression, body language and hand signals. 12) Deaf dogs get along just fine with other dogs and people as long as they are socialized from puppyhood on - just like hearing dogs. If anyone has ever thought about including a deaf dog in their family, whether the dog comes from a breeder, a rescue group or a shelter......give it some serious thought. One great resource is the Deaf Dog Education Action Fund (DDEAF). The benefits of a SENIOR DOG!! From time to time we have senior Danes available for adoption, most are surrendered because their owners are unable to care for them any longer. Some we have pulled from shelters after they were left there, we feel the senior Dane is still a valuable member of the family and they should be allowed to live out their lives in comfort and happiness! 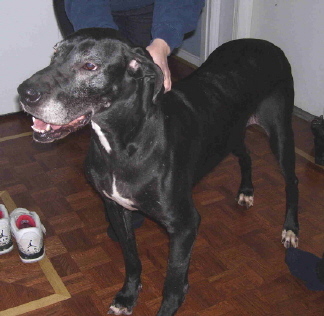 PLEASE CONSIDER ADOPTING A SENIOR DANE!! They are already potty trained! !